Known for its fantastic photography, thoughtful layouts and insights from leading experts, Gardens Illustrated Magazine offers an inspiring mix of stunning gardens, design and plants. At once beautiful and useful, the magazine serves as an influential and inspirational horticultural style guide and has been described as the ‘Vogue’ of gardening. 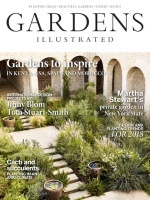 Gardens Illustrated Magazine has won widespread acclaim for its breathtaking photography and exceptional design, not to mention authoritative journalism that inspires with its rich mix of remarkable places, plants and people. Order your subscription today and have each issue delivered to your door. Gardens to inspire in Kenya, USA, Spain and Morocco… Martha Stewart’s private garden in New York State… Design and planting trends for 2018… Cacti and succulents – planting in an arid climate… Where designers source their plants – learn the secrets… Dan Pearson’s new vision and 20-year plan for Lowther Castle… How to identify trees on winter walks… Autumn’s inky tones – late season foliage in a Cotswold garden… A kaleidoscope of perennials in a Belgium garden… 26 species of Pelargoniums for colour and fragrance… The best plants for October and where to see them… Choosing and growing apples for taste.. Order your Gardens Illustrated subscription today and get seasonal inspiration like this delivered to your door every month. Who Reads Gardens Illustrated Magazine? 72% of readers are female, with an average age of 54. A fifth of Gardens Illustrated readers are garden designers and professionals and all are dedicated garden lovers who love to further their knowledge and education.